During the Victorian era there was a resurgence of interest in the Ancient Greek and Roman eras. 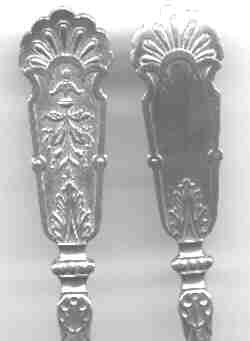 This view was very idealized and the silver which was produced in this classical style was really an adapatation of the neoclassical elements of the British Regency period. For the most part, the silversmith chose just a few Greek forms such as the acanthus leaves, chariots, and Olympian scenes and combined these elements into the "New Greek" revival style. 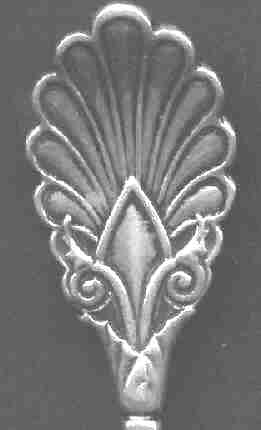 Each silver factory had a number of different interpretations and many different patterns were made. and was patented in 1878 (tablespoon / server). By the exhibition of 1867 the style had spread to Egyptian, Grecian, Pompeiian, Roman-Greek and Renaissance. There are about seventeen different variations of the Tiffany Olympian pattern. This one is known as "Orpheus in search of his wife (click for more info)". Pretty sugar shell in the Louis XIV pattern (1870) by Gorham. I am unsure of the metal quality. Tablespoon size server in the Neo-Grec style. The only mark is "sterling"
This is an 1890 Gorham pattern known as Chippendale. It combines neo-grec, gothic, beaded and even seems to predict the future with certain art deco elements. 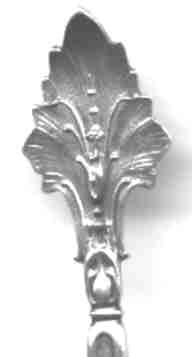 Very large (8.4") serving spoon with a Greek key motif. The only mark is 925, and I am guessing that it is probably American made. 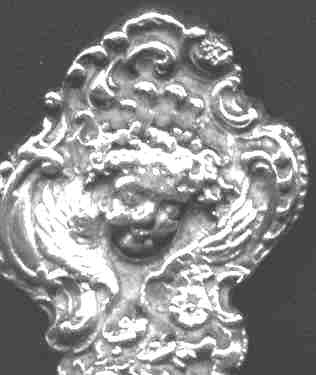 puttis were also popular devices in the early phase of the Souvenir Spoon period and they are also found extensively in earlier Victorian artistry. Dominick and Haff, a very respected silver firm, produced a series called the "Labors of Cupid". left: This nice engraved picture citrus bowl spoon shows Cupid picking grapes. More examples are shown in my first spoon book.